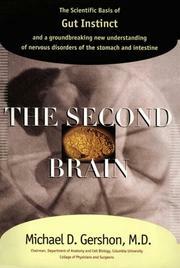 The nature of a so-called second brain in the gut is revealed in exquisite detail by a neurogastroenterologist who has spent some 30 years researching the subject. Gershon, professor of anatomy and cell biology at New York’s Columbia-Presbyterian Medical Center, is enthralled by the sophistication of the enteric nervous system. He calls this system, which operates the bowel, a second brain, pointing out that it contains all the classes of neurotransmitters found in the brain. For nonbiologists entering his world, a whole new vocabulary with terms like neural crest, 5-HT1P receptor, and functional ligand must be acquired. While the terminology can be daunting and the exhaustive details sometimes overwhelming, Gershon has wisely included lots of clear line drawings to help the novice understand the nervous system and the complexities of the digestive system that it runs. Happily, he also tells his story in human terms, paying homage to those whose discoveries enabled his own, good-humoredly sharing the exhilaration of jousting with colleagues over his theories, and generously describing the skills and inventiveness of researchers in his own laboratory and those of other neurobiologists. As this research sheds light on how the “brain in the belly” controls the behavior of the bowel, progress can be expected in the prevention, treatment, and control of gastrointestinal disease. When patients present with gastrointestinal problems for which doctors can find no specific cause, too often they are dismissed as neurotic complainers. That answers may be found in the enteric nervous system offers new hope for the 20 percent of Americans diagnosed with functional bowel disorders. An authoritative work that makes abundantly clear the value of basic research; unfortunately, it’s encumbered with an intimidating amount of technical detail that may discourage interested readers.